PresenterNet, a provider of online interactive Web presentation applications, today launched PresenterNet Mobile Edition, the industry’s first mobile Web Conferencing application. 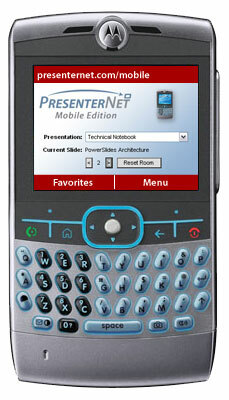 PresenterNet (http://www.presenternet.com), provider of online interactive Web presentation applications, today launched PresenterNet Mobile Edition, the industry’s first mobile Web conferencing application. The new mobile application enables users to present from anywhere using only a PC or a Windows Mobile 5.0 enabled phone or PDA. Wolfgram further explained that PresenterNet’s experience with Ajax technology and it’s Web 2.0 implementation enabled this Web Application to run on Windows Mobile. Information on PresenterNet Mobile Edition is available at http://www.presenternet.com/mobile . PresenterNet’s online services emphasize high-impact interactive presentations, data collection from prospect interactions, database applications and customized reporting. The company has committed all of its products to compatibility with industry standards, such as Macromedia Flash, Macromedia FlashPaper, Microsoft Internet Explorer, PowerPoint™, Mozilla, and Apple Macintosh, as well as emerging technology leaders like Skype. PresenterNet’s founders have been developing and implementing sales and marketing technologies for nearly 25 years. Past clients have included Toshiba, SGI, Philips, NEC, ITT, Litton, Fujitsu, and HP. PresenterNet on Windows Mobile 5.0PresenterNet runs on Windows Mobile on your phone or PDA.